I've been garnering interest with no-bake recipes after my successful attempt with the Blueberry Cheesecake. They are quick and easy to do, plus they taste not too bad as well. It just so happened that I managed to stumble upon another box of mix shortly after - the Jell-O Oreo! The pre-prepared ingredients could be found inside the box, as like any other mixes. What I appreciated more about the Jell-O Oreo is that the steps are labelled on the packets! I didn't have to fumble over which ingredient is which. Inside, you'll find 3 different packets of items. They are the crust mix made from Oreo cookie crumbs, the filling mix, as well as Oreo cookie pieces. You'll need to purchase butter and milk separately. 1) First, I poured the crust mix into a bowl. Then, using 4 tablespoons of melted butter, I mixed them all up together! Make sure crumbs are evenly moistened. 2) Next, pour the filling mix into another bigger bowl and add 1-1/3 cups of cold milk. It is said that for best flavour, do not use non-fat dry milk. Also, filling will have a soft set if it's made with soy milk. I'm supposed to beat with mixer on low speed 30 sec, then beat on medium speed 3 min. However, I do not have a beater! Alternatively, I used a spoon instead. 3) Reserve 1/2 cup of the Oreo cookie pieces and pour the remaining into the filling mix. Gently stir until well blended. 4) Now it's time to give it it's shape! Add the crust first before the filling into an empty container, or whatever you're using to serve this dessert. Top it off with the reserved Oreo cookie pieces, refrigerate it for an hour, and it's good to go! If you'd like a crunchier topping, you can sprinkle the cookies before serving instead. I made the cake for a friend's birthday, thus I was extremely cautious as I wanted it to taste good. But seriously, my worries were unnecessary. What could go wrong with Oreos!? It turned out rather well, though the crust was rather powdery. I'll probably need to add more butter for it to stick together better. 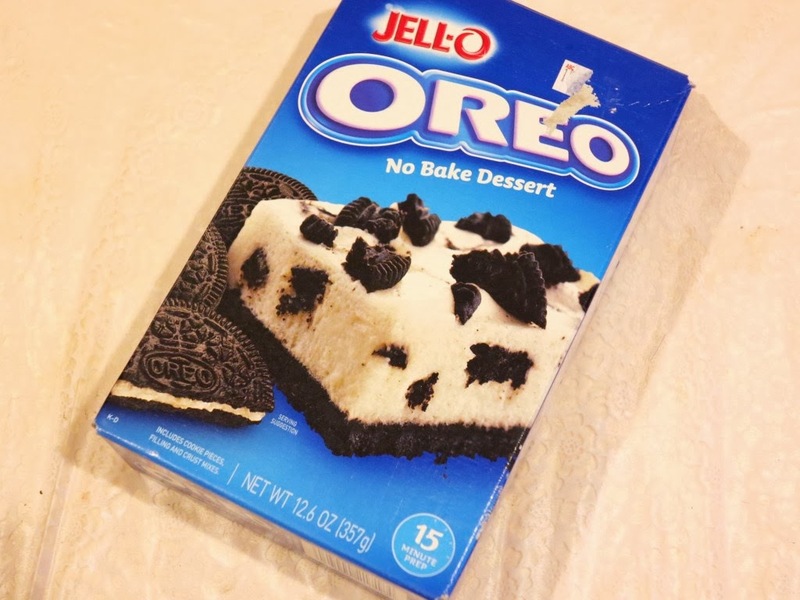 Hey would like to ask you where did you get your jello no bake oreo cheesecake mix from! Hi May i know where is the abc mart? do you have the blk number? What kind of milk and butter did you use?